BRANDON, Man. — Brandon will be alive with music and art on Saturday, and Brandon University (BU) students and faculty will be in the middle of it all. Band 101 begins on Saturday morning, showcasing 268 musicians from BU and the Brandon School Division. 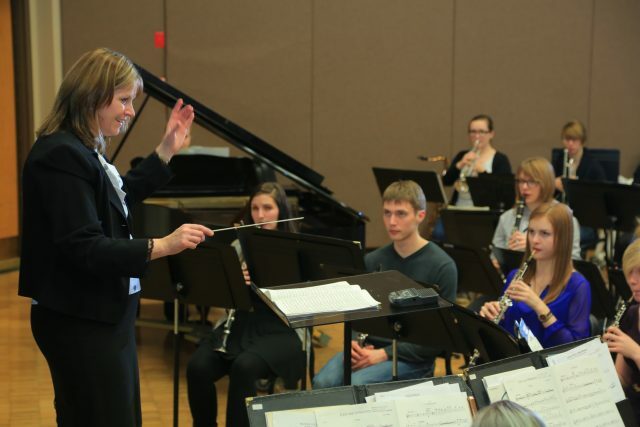 Grades 9–12 band students, under the direction of Anna Penno and Meaghan Walker, will take part in rehearsals and seminars along with members of the Brandon University Symphonic Band, directed by Wendy McCallum. 4 p.m., for performances open to the public. BU students and faculty will also be heavily involved in Saturday’s Wheat City Nuit Blanche as part of the Canada-wide Culture Days celebrations. Musicians and artists will be active throughout downtown Brandon from 2 to 5 p.m., at Fraser Sneath Coffee, Wildflower Café, Abby Rose Boutique and Ten Thousand Villages. The events will continue at the Art Gallery of Southwestern Manitoba (AGSM) from 7 p.m. to 1 a.m. Wheat City Nuit Blanche is co-curated by Leanne Zacharias of the BU School of Music and Natalia Lebedinskaia of the AGSM, with help from Brandon University Students’ Union Study Project Assistants Aren Teerhuis and Jessi Gilchrist. Faculty and students from BU participating include Kevin DeForest, Aaron Wilson, Lisa Wood, Eric Platz, Derek Brown, Ben Davis, Andrée Dagenais and the BU Chorale, Michael Cain and Sola, Adrien Lefevre, Jimmie Kilpatrick, Christian Ilagan, Mark Rosales, Jordan Panko, Ben Roloff, Tim Brown, Alanna Hunter, Alyssa English, Erika Einarson, Isaac Rohr, Lauren Teterenko, Bryant Wahl-Perrin, Franchesca Herbert Spence, Jessi Fosty, Albyn Carias, Benji Penner, Josias Sanchez, and more. For a schedule of Wheat City Nuit Blanche events, see agsm.ca.